By Piotr Małek and Mateusz Mucha. 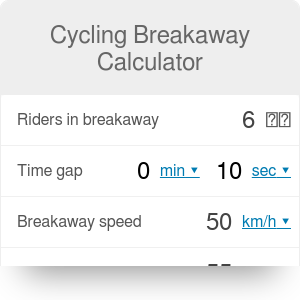 Cycling breakaway calculator estimates the time and distance needed to catch a breakaway in a cycling race. Cycling races wouldn't be half as exciting without all the breakaways that we get to see and cheer for at every race. Riders get into breakaways for plenty of reasons - to widen the gap between them and their main rivals on the mountain stages, to grab particular jerseys and win classifications and most usually to win stages and races. And often the biggest question that millions behind TVs ask is - will they make it or not? Different equations are used depending on the number of riders. If there are 10 or more cyclists in the breakaway equation assumes they get tired at the same pace as the peloton riding at the same speed (this relation has also been tested). The lower the number of riders, the more important role fatigue would play and the lower distance peloton would need to catch them. The equation doesn't take into consideration factors such as wind or road's profile and will be most accurate on flat stages. Time gap is expressed in hours, speed in kilometers per hour. Piotr Małek and Mateusz Mucha. Cycling Breakaway Calculator can be embedded on your website to enrich the content you wrote and make it easier for your visitors to understand your message.